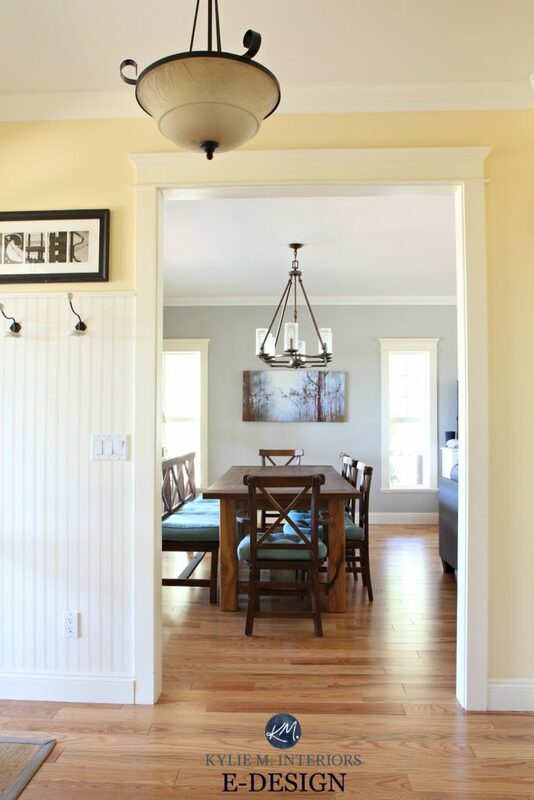 Whether you’re painting walls, furniture or cabinets, the rustic farmhouse look is taking the country by storm and raising country style to a whole new level. And when I say storm, I’m not kidding! The rustic farmhouse style is dominated by stormy grays, greiges, purple, blues, and other colours with subtle, and not so subtle, gray undertones. Along with those stormy tones we’re seeing drops of pastel, vintage and lived-in colours with old-school charm. 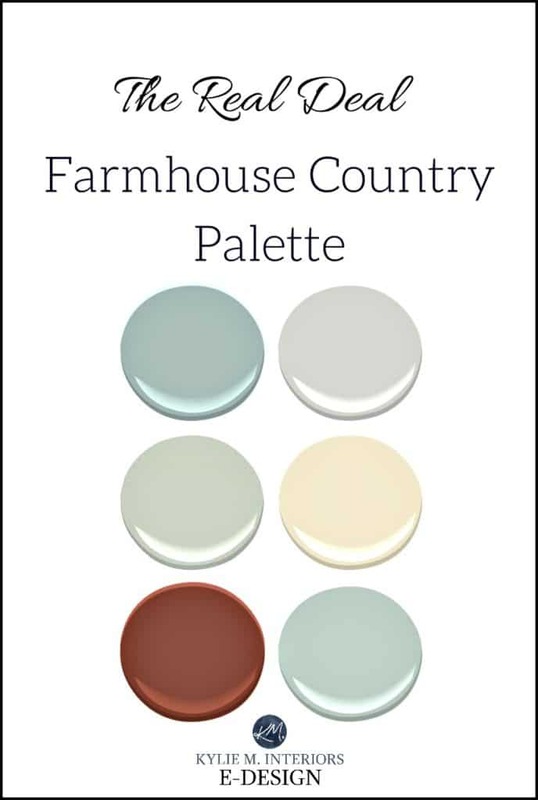 What are rustic farmhouse paint colours? Generally speaking, they are colours that give the illusion that they’ve been ‘lived in for a while’ and not the ‘kids fingerprints plastered up your stairwell’ kind of lived-in, but rather the ‘slightly’ worn look that gives a sense of history to a room. And while the rustic farmhouse look has a whole lot of other things going on (like texture, wood tones, etc…) for now I’m going to focus on paint colour ideas and inspirations to get you in the rustic mood! The soft and subtle look is a layering of soft neutrals, more of a whisper of colour rather than a full-time commitment! This soft gray has slightly beige, warm undertones that stop it from feeling cold and icy like a lot of other grays. I find Revere Pewter on its own just a smidge heavy for a ‘light and fresh’ Farmhouse look, however, when lightened by 50% it’s PERFECT! Gray Owl is one of my FAVE grays because of it’s subtle blue/green undertone. Cloud White is a beautiful soft, warm white with a touch of a neutral base to calm it down. If you feel like committing to a bit more colour then this palette might hit your happy place! A blue with a vague gray/green base. 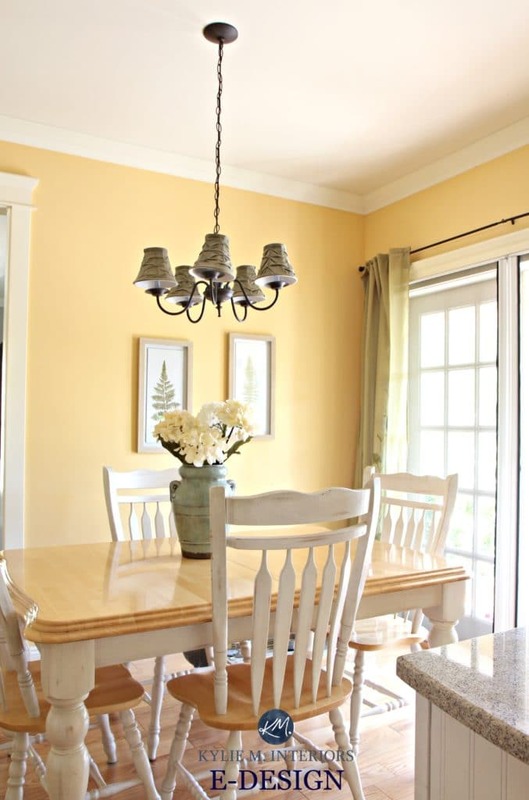 A fresh cheerful yellow that isn’t TOO day-glo. Beautiful for walls. A lighter grayed out green with a soft colourful touch. A beautiful blue/green blend with a subtle gray base. Call it romantic, call it glam, call it whatever the heck ya want – I call it beautiful! Stonington Gray is a beautiful light gray with a stormy blue base. For those of you wanting something a bit more moody! A gray with a decent purple base. A beautiful blue with a green/gray backdrop. Are you hankerin’ for some vintage country style? Then this might be the palette for you! 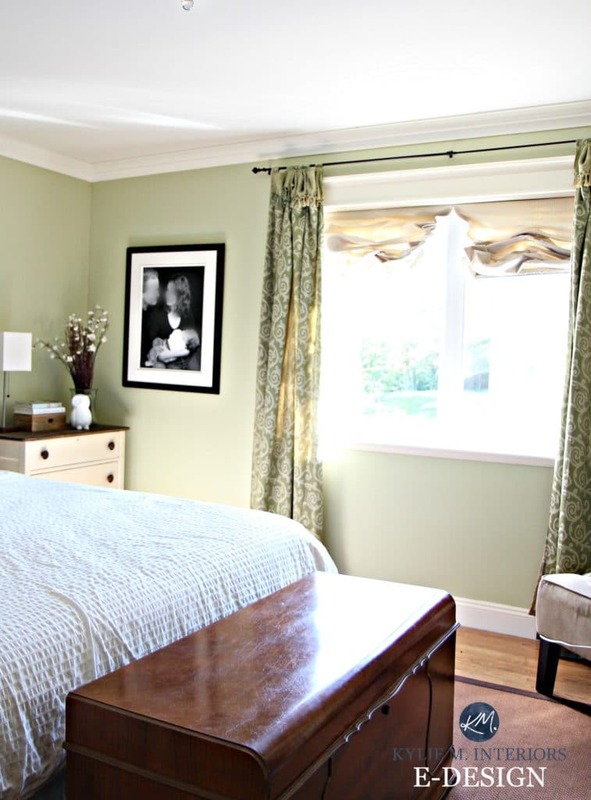 Prescott Green is a beautiful vintage inspired green with a subtle gray ALMOST sage inspired base. A vibrant real red without the more modern rust or burgundy edge. A fresh, creamy yellow in the off-white range. A more standard gray with very little undertone. A beautiful slightly more rich teal. A beautiful light/medium blend of green and blue with a subtle gray backdrop. Now, of course, there are other things to consider when picking your best paint colours like exposure, room size, interior finishings and personal tastes, but these ideas should get you off to a GREAT start! Do you want your OWN customized colour palette for your home? 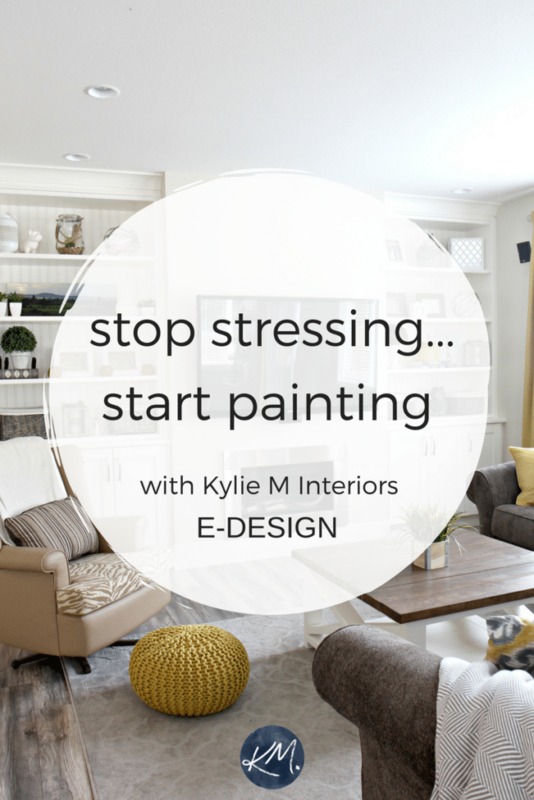 Kylie M Interiors Interior Decorating, Online Consulting, E-design and Colour Consulting Services. Budget Friendly Blog. Based in Nanaimo BC, Vancouver Island and serving the whole darned World! Hi Rebecca! It actually isn’t my project but that’s a stain you’re looking at, rather than a paint colour – which makes it much trickier. It could easily be a blend of a gray stain with a more brown/purple base one. Hi, Kylie, in the Romantic Glam palette, what is the last color? It looks like there are six colors but only five identified. I love that last color. Thanks! Hi Alison, of course the ONE i didn’t mention is the one you love – don’t you hate that! To get a colour along those lines, check BM Rockport Gray, BM River Reflections or BM Cape May Cobblestone, see if one of those feels good!